"The 85-foot-high waterfall cascades wonderfully down into a narrow gorge. The waters of this breathtaking wonder flow down into not just one but two large natural catch basins at the bottom." 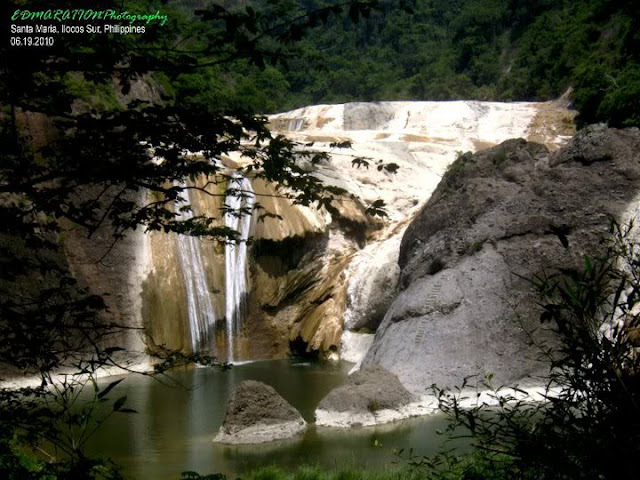 Pinsal Falls is located in the town of Santa Maria in the province of Ilocos Sur. With a height of approximately 85 feet, it is known for being the largest waterfall in the Ilocos Region. 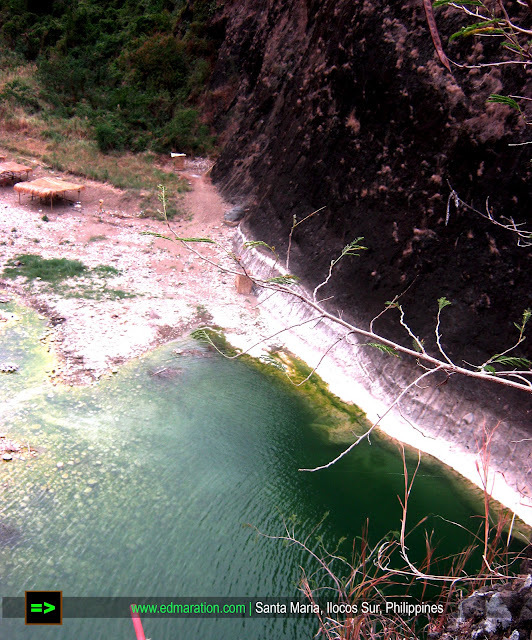 With its inexplicably romantic atmosphere, Pinsal Falls has been a popular location for filming Filipino movies and has become a favorite spot for swimming and for picnicking. The pools at the top of the falls are famous as well. The biggest of these pools figures in a local legend as it is said to be the footprint that was left by an Ilocano giant who was running off in search of his wife. There is also a famous spring with boiling-hot water at the top of the falls. Its cool setting makes it a pleasant spot for a picnic. The 85-foot-high waterfall cascades down into a narrow gorge. The waters of the falls flow down into not just one but two large natural catch basins at the bottom. Visitors may swim in the clear waters. A hidden cave may be found behind the main waterfall. Steps carved into the hillside lead to up to the top of the falls. Pinsal Falls is found among verdant hills which are covered with shady trees. A number of other interesting natural features of the area may be seen along the way. Salty water drips down from a point in the southern hillside on the steps going up to the pools. Also located along this stairway is a protruding stone that is said to resemble a man’s sexual organ. At the top of the falls can be found a number of natural pools. There is also a hot spring, a pool that is full of swirling water that is hot enough to boil an egg in about 10 minutes [It was a regret for me not to see this hot spring because my companions were tired]. The largest of the natural pools at the top of the falls is said to be the footprint of the mythical Ilocano giant Angalo. According to local legend, the giant was supposed to have left it when he went off in search of his wife, the female giant Aran. The mythical giant couple Angalo and Aran also figure in many other Ilocano myths and legends. The waterfall lies among the shady hills and mountains of Barangay Babal-lasioan in the town of Sta. Maria, Ilocos Sur, which also famous for its parish church which dates back to the Spanish era. Pinsal Falls is about 45 minutes away by car from Sta. Maria’s municipal hall. The falls may also be reached by foot from the nearby town of Pilar, Abra, through a set of stone steps in the mountain by the falls. These steps are regularly used by the residents of Pilar to travel to and from the town of Sta. Maria. On our way to the waterfalls, I was able to encounter beautiful sceneries of the natural pool created by the waterfalls. Unluckily, when I visited this spot, there was no plenty of waters coming from the falls because it was summer, however it was already beautiful, how more if it has more water? Right? There you have Pinsal Falls!